One of my favorite foods growing up was frito chili pie. I know, so not healthy – guilty as charged. But so good! 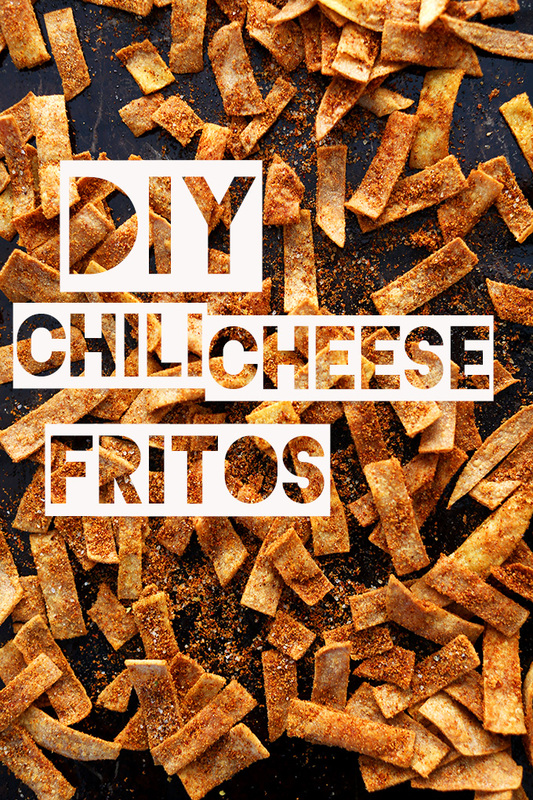 Loads of crunchy, salty fritos topped with hearty chili and handfuls of cheese – so delicious. And no veggies in sight; just the way I liked it back then. Oops. But worry not! Things have changed. I love veggies now. In fact, most nights I request “something with tons of veggies” for dinner. It’s John’s favorite (eye roll). More evidence of my ever-evolving healthy palette is my love for baked things over fried things. Baked chips are (almost) as good as the real thing. So when I recently re-discovered my love for homemade tortilla chips and tortilla soup via the ever-talented Kate, I couldn’t help but dream to recreate my old favorite: chili cheese fritos. 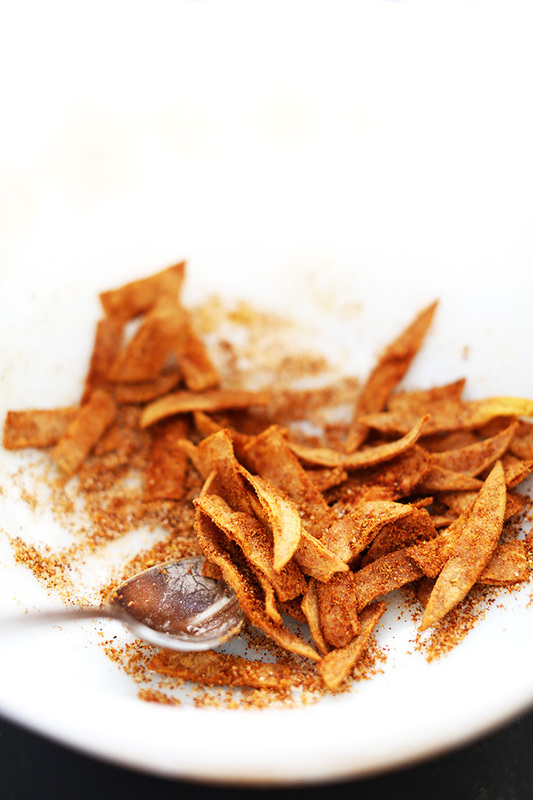 These fritos are so simple and you likely already have all the ingredients on hand. You just need the spices listed above, corn tortillas and a little oil. I also added a pinch of nutritional yeast for a vegan-friendly “cheese” flavor, but it is certainly optional. The best and easiest part, in my opinion? Once baked you just have to find something to bury them under. Like I said, BEST PART EVER. While these chips don’t taste exactly like the original, they are seriously close and way better for you since there’s no frying and zero questionable ingredients involved. Just tortillas, spices and olive oil – straight forward food. Junk food made healthy, indeed. Enjoy! Chili cheese fritos made healthy without any frying or questionable ingredients involved. Vegan and gluten-free friendly and so close to the original! Preheat oven to 380 degrees F (193 C). Add all spices and seasonings to a large bowl and whisk until well combined. Set aside. 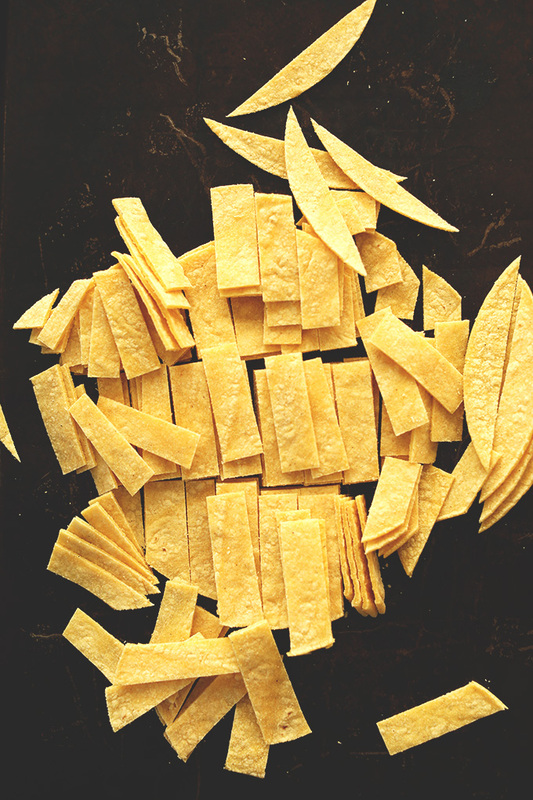 Using a knife or pizza cutter, cut your tortillas into equal strips (see photo). Transfer to baking sheet and toss in oil until well coated. Bake for 12-15 minutes, or until golden brown and crispy. Watch out, they’ll burn quickly past the 14- to 15-minute mark. 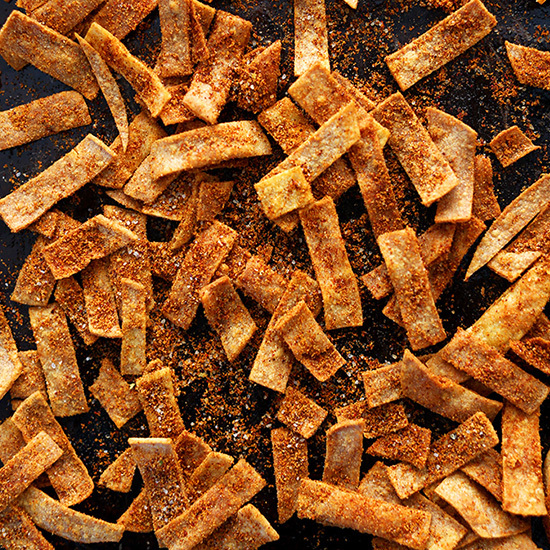 Once removed from the oven, immediately add tortilla strips to the seasoning mix and toss to coat. If they appear to have dried in the oven while baking, you can spritz them with a little oil so the seasonings stick better. Transfer to a serving bowl or plate with a slotted spatula to shake off excess seasoning. 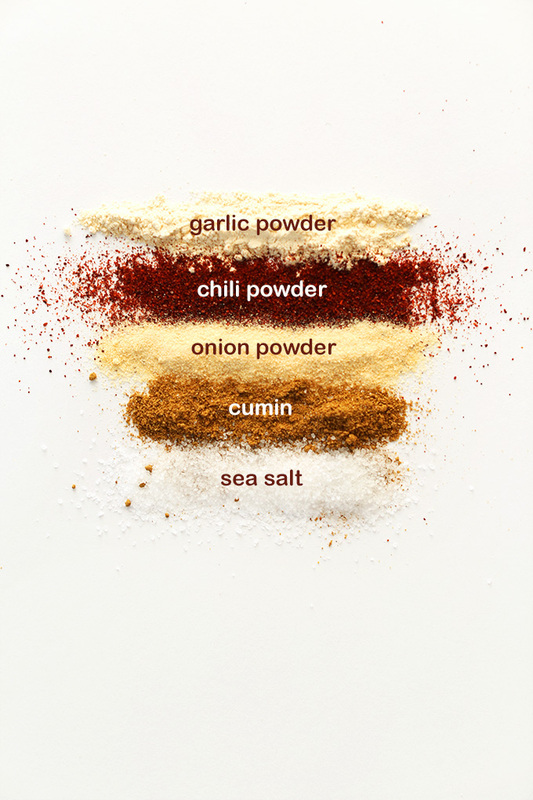 You’ll likely have extra seasoning, which you can store for later use if desired. Serve immediately with chili, soup or dips. Store leftovers in a storage bag or Tupperware at room temp for up to a couple of days, though best when fresh. *1 tsp tomato powder is an optional and great addition, and it will add a bit more chili-tomato flavor. However, it is a difficult ingredient to find in my experience and isn’t really necessary. If you have it on hand, though, add it in! Just discovered this recipe and gave it a go, and can confirm my cravings are settled! I used a medium heat chilli which is still a bit intense for me so if you don’t love heat I’d recommend using a mild chilli or lowering the amount you use. Will definitely be making these many more times! The spices sound great but what about the cheese flavor? The originals have a pretty strong cheese flavor missed with the other spices. Hi Jack! We recommend adding the nutritional yeast for a more cheesy flavor. Feel free to increase the amount called for, depending on how cheesy you like it. Local organic tortillas made these chips sing! I read the recipe too quickly and accidentally combined the oil with the spices right away, tossed the tortillas in and baked: good news! It worked out! Paired them with the red lentil chili. So good. so what do you think if I use flour tortillas? I have a bunch of leftovers that are too dried out that I was going to toss…I think in terms of “corn chip” it won’t be the same but in terms of say…nacho chips? I think I will try it and let you know…anyone else done it this way? Thot this was going to be a healthy jump from GE Fritos. It actually has all the worse-health ingredients imaginable from canola oil to corn tortillas. Unless organics are used theyre 90 % GMO’s. You may as well use Frito Lay’s. LOVE LOVE LOVE your blog!!! Is there a way to make “tomato” ones? My daughter loves tomato fritos. I think the missing element is smoke. I’d add smoked paprika, unless you can think of a decent way to get liquid smoke into the mix. We make a kid-friendly chili that tastes just like Fritos, and the key is a lot of liquid smoke and a bit of brown sugar. Also, your choice of chili powder will make a big difference. I’m still tinkering, but I prefer the dark, tobacco flavor of ancho chiles to a bright, fiery arbol or other pepper. Just buy the dried chiles, tear into pieces, and throw them in the spice grinder. Just made these to go with the red lentil chilli and it was a great combo! It was a fun way to eat chilli + great for sharing. I’ll definitely be making these again and trying more of your recipes! Just made these and did use the Nutritional Yeast. These are so good!!! Thanks! Thank you! As Chili season is here, my DH and I are enjoying our plant based chili with plant based “chili cheese Fritos”. All of your recipe was followed except for the oil. I omitted that step and replaced it with 1.5 tsp plant based ketchup, 3 tsp. Water. Mixed those two in a baggie, then dumped raw strips in to coat. Then baked. The slight dampness allowed the seasonings to stick while we avoided oil. Super! I’m not sure how well this recipe would turn out without oil but if you try it, let us know! I am wondering about Aquafaba to coat instead of oil..
We haven’t tried it, but its worth experimenting! Looks delicious! So making this tonight with your red lentil chili. Think you meant “palate” though, “palette” is rather different. Eating the real chips right now and just found out I can make them from things I already have at home!!! Is it possible is I cut the tortilla into triangles like normal tortilla chips? I totally going to try this. Just made these— SO easy, SO delish! Oh my god, these look so fabulous! I just did a blogger collab Back to School Throwback Party with Runway Chef and Coffee & Champagne. We all made food that was a gourmet take on the junk food we ate in college. This would have been a perfect addition!! I love this idea. These have wonderful potential to be very delicious and very very similar to the real Fritos. My only issue with this recipe is the amount of salt. I made these this morning, followed the spice recipe almost exactly (added a little smoked paprika for flavor), and I think the salt can be dialed back to about half of what the recipe calls for. I’m going to give these another shot that way. Can i use tortilla flour instead? Would the taste still be the same? What do you think? It won’t be the same but still good! These turned out good! I added a dash of smoked paprika to the second batch using the leftover seasoning from the first, and it made ALL the difference. Gave it that extra kinda tomato-y kick. These are dangerous. Shut. Up.!! My ship has come in! Chili cheese Fritos are hubby and my guilty pleasure. We reserve them for road trips and then pretty much eat them till we’re sick. It’s pretty much the only “pantry food” we eat, but when we do eat them, it’s with gusto. So when I saw this recipe, I was elated! We will take them with us on our next road trip and guiltlessly eat them…till we’re sick, but still,healthy! Just now discovered your blog as I am looking for a lunch idea but not chilli today with fritos. But when my husband comes home Tuesday night I might just do this! Today I’m gonna try this for fun using gluten free flat bread I happen to have on hand. Just goingto halve the ingredients and taste test the flat bread. But going to also use some of the corn tortillas today too just smaller ingredient quantity. And, bcz we live in hot dry climate using this recipe will be OK in the morning hours. So excited to make these! so i just made these today and i have a question..
first of all my husband and i really liked these. flavor was really good. the issue i had is that some chips texture were different…some were great and very chip-like, and some were almost…stale? i cooked them for about 13 min and they were all just starting to get golden. any suggestions would be great! thanks! and i LOVE your site..so many great recipes that i’ve tried!! Lisa, not sure what happened! could be the brand of tortillas you used? Lisa just a question comes to my mind possibly the oil freshness? Open the bottle and smell the oil. Randomly came across this recipe while looking up biscuits and decided to make these instead and they were delish!!! I also didn’t have any chili powder so I used paprika and cayenne instead. Thank you so much, I’m already making another batch! Haha. Great idea! Thanks for sharing, Katherine! These are better than Chili Cheese Fritos and I don’t have to feel as guilty! Wonderful for soups and chili. I oddly didn’t have any chili powder, so I used a touch of cayenne and some hungarian paprika. Yummy! I also used white corn tortillas with green chiles baked inside. Smart girl! That sounds amazing. Where did you find the tortillas with green chilis?! I made these last night and they were amazing!!! I am a lover of chili cheese fritos and thought these won’t come close but I’ll try it anyway. Was mixing up the seasonings saying to myself wayyyyy too much garlic, wayyyy too much cumin, but then when I got all the seasonings mixed in a bowl and took one whiff I knew you had nailed it!!!! I think I just might use that seaoning mix for other things like in my taco filling or even chili!! Thanks for a much healthier version. These look AMAZING! Such gorgeous pictures! Before he met me, my fiancé was all about junk food (we’re talking fast food, frozen pizza, Little Debbie’s snacks, the whole 9 yards), and I’ve worked hard to wean him off processed crap over the past few years. He’s from Texas, though, and the one meal he really missed was Frito pie. I can’t wait to make these for him as a healthy substitute! I also posted a link of this recipe in my blog, I hope that’s ok. Thanks so much for this recipe! I have never thought about making my own chips before! These look delicious and so simple! I love your photography too! Yummy! I would sugest as healthier option to replace olive oil with coconut oil. The reason is, olive oil is a very healthy oil as long as it’s not heated: “By heating virgin olive oil to over 200 to 250 degrees F, you are runningthe risk of creating an oxidized oil that can do your body more harm than good.” And canola oil is much worse, I have read enough information about it to be sure it’s not a healthy option in any case. Coconut oil on the other hand is kind of a healthy miracle, the best option for cooking, baking and even frying if you can’t resist the temptation. The only “issue” with coconut oil could be the flavor which is very strong and could not get along well with some recipes, but you can just chose to buy it in it’s flavorless (and odorless) form. Thanks again for the recipe, I’m definitely trying it! Cheers! Thank you for this wonderful recipe. Fritos are one of the few chips I truly miss eating. I have never liked corn tortillas but now I have a great way to use them up. Can’t wait to try your recipe. At first I was like–why fritos? I’m glad I can’t buy their addicitiveness anymore! But then I was like COMPLETE GENIUS! We have tacos as part of our monthly menu rotation and no one likes the corn tortillas (we’re gluten free here) and I don’t feel like making flour tortillas (I know they’re super easy, but I’m not motivated). I usually end up throwing a whole bunch of tortillas out because of this, but couldn’t think of another option. So ta-da! I’m going to go make these right now and see if my chip loving family isn’t excited to be eating corn tortillas! Thanks for saving more stuff from the trash for me! Well I loved them! They are perfect for underneath taco seasoned butternut squash nuggets! My husband didn’t like them. Picky dude… he thought they were too spicy?? I might try scaling back the cumin for him, but I really like them just the way they are. Oddly, my 4-year-old daughter loved them so they couldn’t have been terribly spicy! I think they will be replacing regular tortilla chips a lot more often! ps. My husband is even getting into the act saying “yum,” and “we could make that!” Thank you for the fun and interesting recipes that everyone in my house are willing to try. This is a fabulous DIY version of a very popular Mexican treat called Takis or Rancheritos (I don’t even want to know what kinds of fake ingredients are in them). They would be great with a little lime zest added to the mix. Definitely going to try these myself! Um no words just yes! I love Fritos, and if you go with the plain kind, in terms of “questionable ingredients” they are the way to go. They only use corn, oil and salt. Not even preservatives in there. However! I’ve never tried the chili cheese kind so I don’t know about what’s in them and I am not so fond of deep-frying either. I can’t stand that oily feeling on my lips. These sound fantastic. Putting it on my list for leftover tortillas! Ellen, honestly the ingredients in CC Fritos aren’t terrible. I just don’t like the use of “cheese powders” and am not so sure about what preservatives are in there… But this simple, vegan friendly version certainly gets my approval for health- and taste-factor. Hope you enjoy! YUM! I’m a weirdo who’s not really into chips (just never have been) but these look mighty tasty! 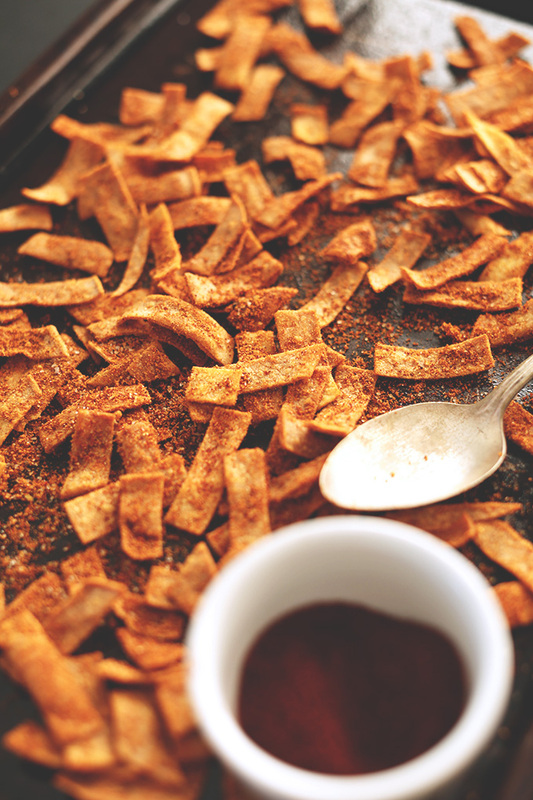 I love baked tortilla chips but I never get this creative – I usually just do mine plain and that can get boring. I love this spiced up version and I bet it would make a great snack to take to work. Pinned! How did you know I was looking to make this very dish – Chili Pie this wknd!! Thanks!! Genius! Who knew you could make them from scratch? These look so good! Next time I have leftover corn tortillas, I know what I’ll do with them. Have not bought any chips in a long time because they are so unhealthy. Bonus of making my own is not only are they healthy, it’s work so I won’t make them that often! In the interest of minimalism, could I ask you to think about trying to streamline the print version of your recipes? Because this prints on two pages, which means I either don’t get the nutritional info, which I would have liked to have, or use two sheets of paper. I know, I could flip it over. OTOH, the header is 3 plus inches, and the notes another inch. Great idea Annie! Thanks so much for the suggestion! I wanted to keep all the info on one page if possible, so I simply made some of the fonts a bit smaller on the print version. It should be updated now. These look so delicious and so easy! (plus so addictive, I’m sure.) I absolutely adore loads of veggies, too. It’s pretty much all I eat. Those honestly look even better than Fritos. Then again, I am a sucker for homemade anything involving tortillas. Definitely adding this to my list of things to try (aka: Pinterest). Sam, honestly they kind of are! I was surprised how much they tasted like the original only less suspiciously crunchy and over-salted. Thanks for sharing! 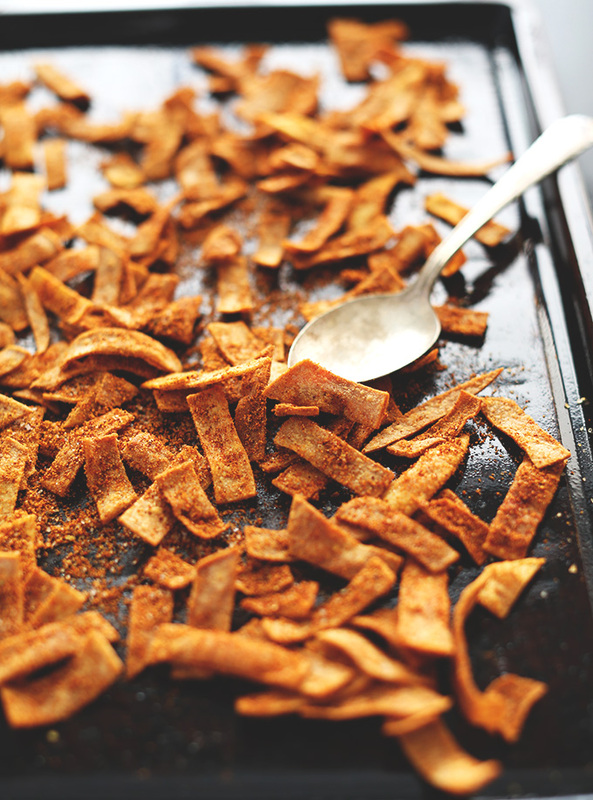 I would’ve never thought it would have been so easy to make Fritos at home. The best thing is that you don’t have to sit thinking about how bad these are for you while you savor each bite. Way way healthier than buying some chips but still look super delicious! These are amazing! I never really buy fritos unless my brothers are around and I made chili. It is one of their favorites, but I am not a fan of the fried stuff either. These are awseome! Hope you (and your brothers) like these, Tieghan! Dana I NEED THESE! I love Fritos! Mmm, so good but I don’t buy them anymore. DIY is amazing Pinned! Wow. I might have to make some of these later today. Thanks for sharing.